A Christingle Event held in school at Christmas could be a lovely family occasion that younger siblings as well as those already in school can join in with. It is essentially a Children’s Society fund raising opportunity to help children who are vulnerable, alone and have no-one to turn to. It is a Christmas gift to those children, which is a great lesson for children in the UK where even the poorest have a lot compared with others. The Christingle itself is an orange, representing the world. It is decorated with sweets and dried fruit representing all of God’s creations. Red tape or ribbon representing the love of Christ is wrapped around it and and a candle represents the light of Jesus shining in the world. It was introduced into this country in 1968 so is celebrating its fiftieth anniversary here. Celebrate 50 years of Christingle with The Children’s Society from The Children’s Society on Vimeo. The Christingle Event can be celebrated in Church, in school, out of doors, it can be virtually anywhere but it is a great event for families and friends to join. There is a free guide to help plan an event for school. Christingle’s 50th anniversary is a great opportunity to get everyone together for an even bigger celebration. 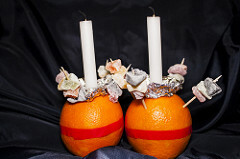 Host a retro Christingle event with a 1960s theme. Have a birthday party to celebrate Christingle’s 50th year. Try a record attempt eg how many Christingles can you make in 50 minutes?